14k gold and 2.0475ctw of diamonds bangle bracelet. 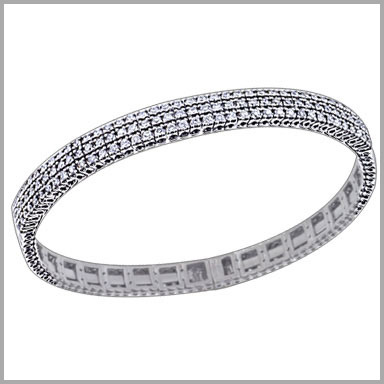 Splendid style and dazzling diamonds make this beloved bracelet a must have! Crafted in your choice of polished 14K white or yellow gold, this flex design bracelet features 117 full round cut diamonds. They are all beautifully placed in a triple rows to make up the lovely design. The total diamond weight is approximately 2.0475ct with a color of GH and clarity of SI2. It measures 7" x 1/4" a bangle design clasp.